Before SFMTA “legalizes” Private Commuter Shuttles (“Google Buses”), an EIR is needed to quantify impacts on Muni, traffic, streets, neighborhoods, displacement, gentrification, ADA accessibility… “Google Buses” hamper Muni buses and are themselves stuck in traffic for hours at a time. By merging corporate shuttle funds with public transit dollars, commuter travel times can be shortened for all riders—with free feeder lines, transit hubs, dedicated highway lanes….Instead of a two-tiered transportation system, one for the rich and one for everyone else, the overall transit system should be planned and transformed. We request that the Shuttle Pilot Program not be made permanent—pending a full accounting of legal violations, pending litigation and an EIR. FORMAL PUBLIC REQUEST: As due diligence, we request that SFMTA staff work with the City Attorneys Office to clearly list laws and regulations that may be violated by the Private Shuttle Program—to better inform agencies and the public. · Violation of California Vehicle Code 22500(i) and other state traffic laws. · Violation of State Constitution, prohibiting public transit agencies from subsidizing private bus operators—in essence undermining public transit. · ADA (Americans with Disabilities Act): Company workplaces must comply fully with ADA, and shuttle buses are literal extensions of the workplace—where tech workers often work during commutes. Disabled and senior workers must have equal rights to shuttle buses. Moreover, blockage of public bus stops has hindered public ADA access for Muni. · Violations of street-use regulations and traffic laws, in terms of weight capacity, bus size, passenger count, street width, turning radius, noise, pollution, historic neighborhoods, small-scale neighborhoods, overall quality of life….The SFMTA’s Restricted Streets Map, Caltrans Arterial Street Network Map, DPW requirements and other regulations have cumulative restrictions for most buses—both small and large. Generally, most city streets are not engineered for the frequency and weight of large trucks and shuttle buses. 3. Transit Equality: Speed up commute times for tech workers and everyone. Corporate bus delays Muni 24 Bus at southbound Castro/ 25 Street. Dolores between 22/ 23 Streets. No fee is paid at parking stalls. Corporate bus obstructs narrow 2-way Vicksburg at Elizabeth Street. Corporate buses delay traffic at Muni bus stop—24th/ Church Streets. Holistic commuter plan is needed—to speed up travel times for everyone. As shown in the Budget & Legislative Analyst’s report to the Board of Supervisors, titled “Impact of Private Shuttles” (March 31, 2014), a full Environmental Impact Report (EIR) is needed for the private shuttle bus program—before it is made permanent. · San Francisco must reinforce its Transit-‘First Policy, uncluttering Muni bus zones and congestion. · In 2014, Muni’s on-time performance declined from 60% to 54%, as private shuttle buses increased. · The SFMTA Board should rescind permission for shuttles to operate in public bus zones—in violation of the California Vehicle Code. Other violations include state/ local traffic laws, vehicle street restriction laws, air quality/ noise ordinances…. · The EIR should evaluate air quality impacts and degradation of street infrastructure. · The EIR should evaluate impacts if hundreds of other companies start private shuttle service. · The EIR should evaluate transit inequity—instead of well-heeled riders on luxury buses segregated from “low-class” Muni. · The EIR should evaluate the impacts of private shuttle buses on property prices, rent costs, evictions and displacements of low to middle-income residents and businesses—per recent academic studies. · The EIR should study transit integration—with public feeder lines to transit hubs, regional express bus lanes, free shuttle buses for both tech workers and the general public…..
YOUTUBE VIDEO: “Five Years Later—Are [Google] Shuttle Buses Useful Or A Menace? Video shows impact of private shuttle buses on neighborhoods. Buses run before 6:30AM to 10:30AM and again from 4:30PM to after 10:30PM. There are 20+ buses per hour on different routes. Hundreds of companies can start private shuttle routes. In 2004, Google was the first company to start private shuttles, making 2 stops in San Francisco. Today, Google makes180 runs/ stops throughout the city—every day. Currently, a relatively small number of companies operate shuttle buses (Google, Yahoo, Genetech, Apple, Facebook, Netflix, Electronic Arts, eBay, LinkedIn…)—but already there are 2,900 stop-events per day in San Francisco. Over time, hundreds of wealthy companies can start shuttle systems, creating gridlock and a two-tiered transit system—luxury buses for the rich and a hobbled Muni for everyone else. Tour Buses (over 8 passengers) are currently prohibited from many neighborhood streets. Private shuttle buses are larger and heavier than tour buses, impacting even narrower streets. · Many San Francisco neighborhoods already prohibit vehicles over 3 tons and buses/ vans with 8 or more passengers. Private shuttle buses are much larger vehicles with much greater weights (over 25 tons)—operating from early mornings to late nights. · Ignoring weight restrictions and being extra heavy, commuter shuttles are tearing up roadbeds, scraping pavement on steep streets, denting parked cars, crashing into Muni ramps and driving up maintenance costs. · Commuter shuttles use narrow streets, blocking traffic, making awkward turns, endangering opposing traffic lanes and putting pedestrians/ bicyclists at risk—with unnecessary high legal liability. 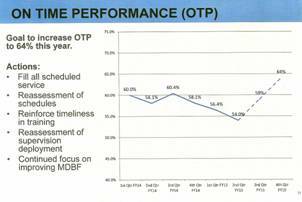 Muni’s on-time performance declined in 2014, after years of increases. With hundreds of shuttle runs, public bus stops/ streets have been jammed, blocking Muni vehicles, Muni bus stops, Muni boarding and traffic. If hundreds of companies start private shuttles, the impacts on Muni will grow. Private shuttles are unsustainable. Since 2000, transit modal shares have remained unchanged at 25%. Per capita ridership declined. Muni’s on-time performance has declined in 2014—from 60% to 54% (85% is set by law)—after years of increases. Private shuttles routinely violate requirements of Pilot Plan. Observers find little enforcement of the Pilot Plan. Violations include no bus identification tags, use of unauthorized bus stops, use of 3-ton restricted streets, violations of vehicle codes and traffic codes. Field observations see worsening air pollution, noise and quality of life. EIR is needed to study impacts on rising rents, displacements and evictions. 48 HILLS: Who pays for the damage tech companies has done to SF? I don’t think I’m the only one who has noticed a huge increase in the number of tech shuttles clogging the city’s streets. And a new study confirms that the number of shuttles is going up– and areas where there are shuttle stops have more evictions. [MAP]: Between June 2014 and July 2015, the number of shuttle bus stop events in San Francisco increased by 46 percent, from 2,032 to 2.978. According to the SFMTA, there are now 203 shuttles in operation in San Francisco, traveling 118 routes. [MAP]: Map showing that 69% of no-fault evictions between 2011 and 2013 happen within 4 blocks of tech bus stops in San Francisco. By the Anti-Eviction Mapping Project. Let’s put the tech shuttles in the context of a new report outlined in TechCrunch suggesting that one-third of the rent costs in San Francisco are due to venture capital. Yes, we have (modest) fees for affordable housing and transportation. But everyone freely admits that they are inadequate to cover the full impacts. ALTERNATIVE SOLUTIONS: Regional express bus lanes can get all commuters to work faster—because even private shuttles are stalled in highway gridlock. Corporate transportation expenditures can be combined with public transit funds to create feeder lines to transit hubs, a regional express bus system and free shuttle bus loops. Highway express lanes, for carpools/ commuter buses, would speed up travel times for tech workers and the general public—transit equity. Rapid buses can also feed BART and Caltrain Stations. The Bay Area Regional Express Bus Plan Study should be implemented—by combining corporate and public transportation funds. Tech Partnerships: Commuter cloud-based software, apps and consolidated funds. Public transit and tech commuter needs can be merged for mutual gains. Technology can significantly simplify transit-management—the objective being to speed up commute times for everyone. With enhanced management of carpools and express buses, the number of vehicles on the road can be reduced and travel times accelerated—for everyone. Free Shuttle Bus Loops are the biggest transit trend in the U.S.
Free shuttle loops are the hottest transit trend in the United States—like in Baltimore, Dallas, Raleigh, Denver, Minneapolis, Bethesda, Aspen, Long Beach, Orlando, West Palm Beach, Scottsdale, Charlotte, Oakland, Emeryville, San Jose, Walnut Creek, Palo Alto, East Palo Alto, Mountain View, South San Francisco, PresidioGo, UCSF, Mission Bay….. The service will be a consolidation of five separate employer shuttle systems. “Through this consolidation, approximately 12,000 shuttle vehicle miles are saved per year,” said Denise Pinkston, chair of the board operating the system. We urge compliance with existing laws, rescinding use of public bus stops, prioritization of the Bay Area Regional Express Bus Plan Study and an EIR of the private shuttle bus program before it is made permanent—to foster a faster, regional commuter system. dedicated to improving the entire Muni transit system in every neighborhood quickly and inexpensively—with best practices from around the world, transit-preferential streets, bus rapid networks and high benefit-to-cost infrastructure projects. This April Fools Day, Artists, activists and community members came together to stage Gmuni: a free buses for all launch party. They’re celebrating an imaginary Google service allowing the public to ride the private shuttles, “Google Buses,” for free since MUNI is in crisis, and a fare hike is imminent. We want a comprehensive EIR on the displacement impacts of the commuter shuttles in San Fransisco. Why should there be an EIR? The demand for private access to public bus stops is likely to increase — Apple’s new Cupertino campus will employ 13,000 people and another North San Jose campus, for which Apple paid $165 million in cash, will employ 18,000. Other Silicon Valley companies are also expanding. What are the housing plans for the new employees? All parts of the program that involve stopping in public bus stops are AGAINST STATE LAW. Please attend the appeal of the permanent commuter shuttle bus program on January 26, 2016. The appeal will start at 3 p.m., but please arrive early. We expect many people to be there. SAN FRANCISCO (CBS SF) — Getting to and from downtown San Francisco during Super Bowl week may become a challenge and Bay Area Rapid Transit says riders will need to take into account some changes. While Super Bowl 50 will be played at Levi’s Stadium in Santa Clara on February 7, main activity during Super Bowl week will be at the foot of Market Street in San Francisco. The Super Bowl City fan village at Justin Herman Plaza is located just above the Embarcadero Center Station. BART says it will close the Embarcadero station entrance/exit to Market Street at Spear Street from January 30 through February 7, except during the hours of 6:45 a.m. to 9:45 a.m.
BART says the other five entrances to Embarcadero Station would remain open during business hours during Super Bowl City. Montgomery and Powell stations are also expected to be busy as it will be the stop for attendees to the NFL Experience at Moscone Center, a few blocks from Montgomery St. The agency says it anticipates the highest ridership on BART will be Saturday, January 30; and Wednesday, February 3 through Saturday, February 6. BART plans to add additional cars to trains during non-commute periods, especially on lines that serve San Francisco and Oakland airports. Monday, February 8 is expected to be especially busy on lines serving the airports. BART recommends buying round trip tickets when possible. BART staffers may also set up tables to augment ticket sales at six stations: Fremont, Dublin/Pleasanton, Millbrae, El Cerrito del Norte, Pittsburg/Bay Point and San Francisco International Airport Station. Use a Clipper Card to avoid lines at the ticket machine. For the Super Bowl, the Metropolitan Transportation Commission is offering limited edition collectible Clipper Cards with images of the Super Bowl 50 logo, Levi’s Stadium and the San Francisco skyline. Plan for limited parking. Unless riders have a monthly parking permit, BART strongly encourages riders to avoid driving themselves to BART station as lots are expected to be busier than usual. 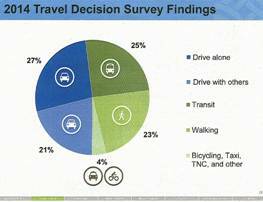 Consider mass transit, carpooling, bicycling or having someone drop you off. The delivery of a long-term federal transportation funding package took many by surprise, even though it had taken a decade to arrive. Signed into law on Dec. 4 by President Obama, the Fixing America’s Surface Transportation (FAST) Act is the shot in the arm that has long been needed to maintain, modernize and expand the nation’s transportation infrastructure. However, while it’s a great down payment, the $305 billion it provides falls far short of the needs in the Bay Area and other urban regions that have extensive multimodal systems requiring repair and expansion. California’s share of the total, for example, is $26 billion. But that’s well under half the nearly $60 billion in the state’s deferred road maintenance alone, let alone the even larger cost of statewide transportation requirements that Gov. Jerry Brown announced last January. Greater funding predictability for states. With its five years of guaranteed funding, the nation’s transportation professionals can count on a predictable flow of federal money as they envision, plan, design and build infrastructure. Strengthened freight funding and strategy. New or expanded infrastructure improvement programs will ease the movement of freight, which will boost economic growth and strengthen global competitiveness. The Port of Oakland, which requires $997 million in improvements to remain viable, could benefit. Acceleration of disruptive technologies. The FAST Act will provide substantial grants for new technologies that can cut traffic congestion and improve safety. These investments will accelerate the already brisk pace of the kind of innovation for which the Bay Area is a hub. In Contra Costa County, for example, decision-makers are looking at how autonomous vehicles and vehicle-to-vehicle communication can improve travel patterns.